Samantha has been a part of our family for two months now and she and her brother are becoming very close. Matthew loves to help out, as you can see from the photos. What isn’t as easy to see is how Samantha looks at him. If she is upset, Matthew can calm her down. He just sings for her and she immediately turns toward him and watches him. A couple of the pictures show her watching Matthew very closely. Samantha is holding her head up very well and is very steady. Today, she lifted her head up off of Cynthia’s chest to look at her and held it up for quite some time. At the doctor last week, she weighed 8 pounds 5 ounces so she is still small for her age but growing well. 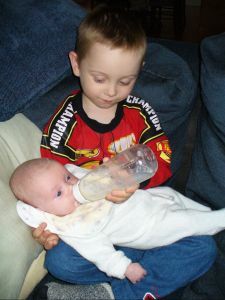 Matthew enjoys having a sister but you can tell he is looking forward to the day when he can play with her and she does more than just look at him. But, he is busy with school and working on learning numbers and writing at home. And video games. I introduced him to SSX Tricky, a snowboarding game, and loves it. He is asking to learn to snowboard so we may do some research to see if there are lessons for someone as young as he is. This entry was posted in Matthew, Samantha on October 20, 2007 by jrand.